DVI Vantage Point is a data visualization engine designed to illustrate your whole travel program in ways you never thought possible. We take data from multiple sources and create rich visualizations organized in an intuitive way. We aggregate expense, travel management and credit card data, industry benchmarks and other value added data sources to create a full view of your company's travel spend and traveler behaviors. Most travel managers run static reports offered by their travel management company. Others have created internal reports from their expense management system or company credit card vendor. Trying to reconcile various data sets from multiple systems has always been the challenge. DVI Vantage Point eliminates the need to view multiple reports or manually aggregate disparate data into spreadsheets. Visualizations tell a story much like an infographic. DVI Vantage Point can provide immediate analysis, comparisons and trends. The information presented can be filtered in multiple ways. Traditional reports largely become out of date soon after they are created, while visualization can change as new data is incorporated. DVI Vantage Point's charts, graphs, maps and gauges allow you to look at your program from many perspectives. You'll see overall travel spend, air spend, hotel spend, rental car spend, traveler analysis, ancillary travel spend and compliance metrics. 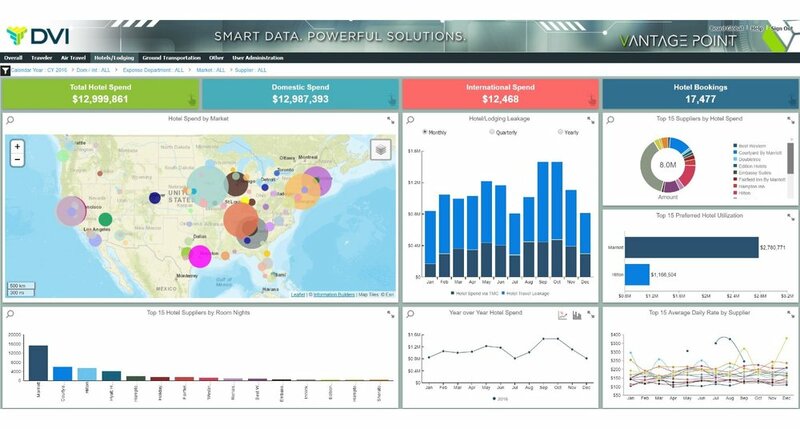 Every visualization is live and actionable allowing users to filter on data points, exclude data points and group data points for comparison analysis. Do you ever wonder how your travel program is performing against other programs? Or are you getting the most bang for your buck by staying in a specific hotel property in a city or market? With DVI Vantage Point you can compare your spend against benchmarks and see your performance with preferred suppliers. Additionally you can see reservations, bookings and charges that were made outside of your approved travel tools. Maybe you want to see data for an individual traveler or a group of travelers that are all exhibiting the same behavior. At other times you may want to see how an entire business unit or cost center is performing against budget or the use of preferred hotels. Need to look at the data by market or supplier? No problem. We have created smart filters that let you answer even the toughest questions about your corporate travel program. DVI Vantage Point will help you to leverage preferred supplier agreements, gain visibility into travel policy compliance and carve out policies based on business need that promote traveler satisfaction without increasing spend. That's what travel big data should be all about.